We may request that you voluntarily supply us with personal information, including your e-mail address for purposes such as correspondence. If you choose to give us personal information via the Internet that we or our business partners may need -- to correspond with you, that information will not be used for any other purposes other than communicating with you. Like many other commercial sites, our site(s) may utilize a standard technology called a "cookie" to collect information about how our site is used. Cookies were designed to help a web site recognize a user&apos;s browser as a previous visitor and thus save and remember any preferences that may have been set while the user was browsing the site. A cookie cannot retrieve any other data from your hard drive, pass on a computer virus, or capture your e-mail address. The right to download and store or output the materials in our site(s) is granted for the user&apos;s personal use only, and materials may not be reproduced in any edited form. Any other reproduction, transmission, performance, display or editing of these materials by any means mechanical or electronic without the express written permission of us is strictly prohibited. Users wishing to obtain permission to reprint or reproduce any materials appearing on our site may contact us at by clicking here. 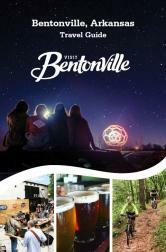 All materials on this site, including, but not limited to, images, illustrations, audio clips, video clips (the "Materials") are protected by copyrights which are owned or licensed by the Bentonville Advertising & Promotion Commission/Bentonville Convention & Visitors Bureau referred to herein as "the Company." You may not reproduce, perform, create derivative works from, republish, upload, post, transmit, or distribute in any way whatsoever any Materials from our website or any other website owned or operated by the Company without the prior written permission of the Company. However, you may download or make one copy of the Materials, and other downloadable items displayed on the site, for personal non-commercial home use only, provided all copyright and other notices contained in the Materials are left intact. Any modification of the Materials, or any portion thereof, or use of the Materials for any other purpose constitutes an infringement of the Company&apos;s copyrights and other proprietary rights. Use of these Materials on any other website or other networked computer environment is prohibited without prior written permission from the Company. By using this website and/or posting Materials, you agree to indemnify the Company, its officers, directors, employees, agents, distributors and affiliates for any and all claims, damages, losses and causes of action arising out of your breach or alleged breach of this agreement. THE MATERIALS ON THIS SITE ARE TRANSMITTED AND DISTRIBUTED "AS IS" AND APPEAR ON THE SITE WITHOUT EXPRESS OR IMPLIED WARRANTIES OF ANY KIND, INCLUDING, BUT NOT LIMITED TO, WARRANTIES OF TITLE, IMPLIED WARRANTIES OF MERCHANTABILITY, OR FITNESS FOR A PARTICULAR PURPOSE. THE COMPANY MAKES NO WARRANTY AS TO THE QUALITY, ACCURACY, COMPLETENESS AND VALIDITY OF ANY MATERIALS ON THE WEB SITE AND DOES NOT WARRANT THAT THE FUNCTIONS CONTAINED ON THE WEBSITE WILL BE UNINTERRUPTED OR ERROR-FREE, OR THAT DEFECTS WILL BE CORRECTED. Where applicable law does not allow the exclusion of implied warranties, the foregoing exclusions may not apply to you. This agreement shall be governed by and construed in accordance with the laws of the State of Arkansas, as it is applied to agreements entered into and performed within that State. Any action brought to enforce this agreement or matters related to the site shall be brought in either the State or Federal Courts of the United States. If any provision of this agreement is deemed void, unlawful or otherwise unenforceable for any reason, that provision shall be severed from this agreement and the remaining provisions of this agreement shall remain in force. This contains the entire agreement between you and the Company concerning your use of the site, and the agreement shall not be modified, except in writing, signed by both parties.